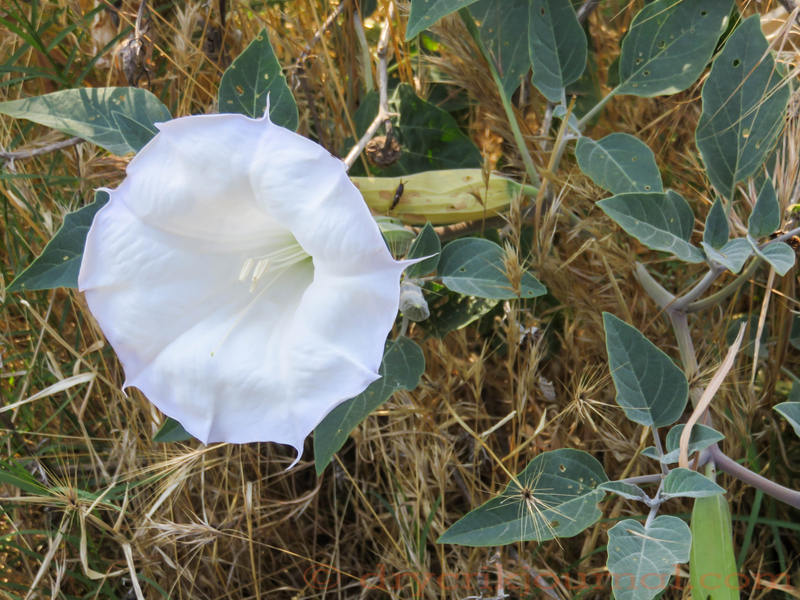 This entry was posted in Haiku 2015, Photographs, Poems 2015 and tagged Datura inoxia, Devil's trumpet, flower-friday, Indian Apple, Jimson weed, loco weed, lovache, moonflower, nacazucul, scared datura, Thorn Apple, toloache. Bookmark the permalink. Thank you, Richard, I think I’ve made the appropriate ID corrections. Sorry to flake out yesterday, just didn’t have it in me, I guess — tuckered out and a bit frustrated with one of my good cameras I haven’t had time to address. I’m afraid that dust has entered its innards, lens looks clean. Hey, you’re entitled to a break. Actually at our age, can’t help but worry a bit when you don’t show. Just glad you’re OK.That dust inside the camera can be a challenge or expense. Good luck with that. I know, Janet. It’s hard to imagine from here where all the prognosticators are talking El Nino, promising rain, little thinking that the opposite of drought is flood, often more devastating and damaging than the dry times. It is beautiful. I remember my sister and I as children making awful smelling bouquets with them.